The Kansas City Royals haven’t lost a game since qualifying as a wild card, becoming the first team to ever start a postseason 8-0. As dominant as the record is, though, it fails to capture the team and city’s Cinderella story properly; the Royals hadn’t been back to the postseason since winning the series back in 1985, but when they finally got their shot they refused to ever give up. They’ve earned that perfect record in countless extra-inning affairs and shut down opponents in close games with amazing defense and intimidating relief pitching. Their fan base is running right along with them, fueled by a kind of adrenaline unique to a sport like baseball that’s a six-month grind often decided by single plays on a given night. The San Francisco Giants are in their third World Series in only five seasons, so it may seem easy to use their consistency as a downer to the Royals’ rediscovered enthusiasm. The Giants, however, are perennial underdogs in their own division to the rival Dodgers, and many doubted their chances against both the Nationals and Cardinals in the postseason. They’ve won dramatic, close games as well, and their clinching victory was made possible by their first three home runs since the wild card game in Pittsburgh. These are two balanced teams who may combine to give us our first close series of the postseason; baseball fans everywhere have countless reasons to be excited, and fans in Kansas City, especially, are paying dearly to avoid missing out. Tickets for Game 1 and Game 2 in KC are reselling at an average price of $1,048 per ticket, with the cheapest standing room seats to each game listed at $619 and $590, respectively. 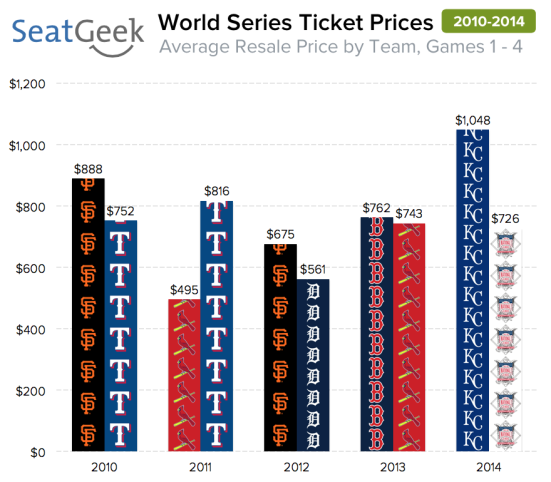 They’re easily the most expensive opening World Series games we’ve seen in a given city over the last five years, topping the $888 average we saw back in 2010 for the first two games in San Francisco. In comparison to most other cities that have recently held World Series games, tickets are about $300 more expensive in KC on average. That’s a hefty premium for waiting nearly three decades to return to the Fall Classic. Tickets will undoubtedly be much more affordable in San Francisco; Game 3 standing room tickets start under $350, but the cost of airfare to and from SF will make that road trip a bit more costly for Royals fans than staying in KC. The cheapest roundtrip flights to the Bay Area are $444 and include a stop in Salt Lake City on the way there and back. A quick scan of available 3+ star hotels shows prices starting at $140 per night, so, for two people, you’re looking at a trip of at least $1,700 before spending a dime on a ticket into AT&T Park. Royals season ticket holders and other fans fortunate enough to have grabbed face value World Series tickets from the team got an amazing deal. Standing room tickets were originally sold for just $165, as were upper-deck seats in the outfield. The highest face value price of $450 for Kia Diamond Club seats behind home plate is still less than the cheapest standing room ticket you can now purchase on the secondary market! Those Kia Diamond Club tickets currently start at just under $2,000 via resale. If you look ahead to possible Games 6 and 7 in KC, prices are even steeper; the average resale price for Game 6 is currently $1,168, and it’s $1,272 for Game 7. Those figures are more than double the numbers we saw for Games 6 and 7 in St. Louis back in 2011 ($500 and $572, respectively), and tickets for Game 6 in Boston last year went for an average of $1,175.